Looking for Something Special for this Years Event? Music and laughter, an unbeatable combination, you bet! Jimmy Travis combines his skills as a terrific comedian, outstanding singer, clever songwriter, and skilled musician to create one unbeatable program. Jimmy's comedy is fresh, clean, and fun for audiences of all ages. His original songs are funny and sure to be a hit with your group. If your organization has a specific theme or is honoring someone special, Jimmy can write a song for the occasion and perform it on the show. In fact, many corporations and associations have hired Jimmy to write songs that have been used in marketing and promotional campaigns on a national level. Multi-talented Jimmy Travis is truly unique and one of the most versatile entertainers in the industry today. With several national television appearances to his credit, he has taken his hilarious comedy and upbeat music to the main showrooms of Las Vegas, Reno, and Lake Tahoe. And has also toured with some of the biggest names in show business. This list includes Wynona Judd, The Righteous Brothers, Barbara Mandrell, and the Smothers Brothers. 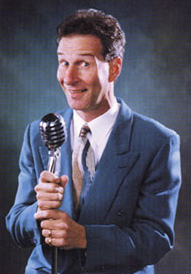 Jimmy Travis has made over 50 national television appearances and is one of the most versatile entertainers in the industry today. From black-tie affairs for IBM executives in New York City to farm associations in Iowa, audiences of all ages and demographics easily relate to Travis hilarious observations on everyday life. A native Floridian, Jimmy Travis attended the University of Florida on a football scholarship and earned a degree in journalism and public relations. After graduation, Jimmy Travis was hired as a featured performer at Opryland US.A. Following two seasons at Opryland, Jimmy Travis landed a spot at sax specialist Boots Randolph's dinner club in Nashville. 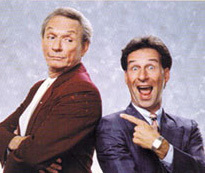 While at Boots', Travis honed the comedic talents that have taken him on tour with such diverse stars as rock and roll legends The Righteous Brothers, Grammy Award winning Wynonna, country queen Barbara Mandrell, political satirist Mark Russell, and comedy giants The Smothers Brothers, to name a few. 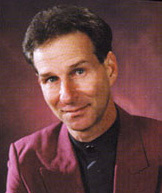 In addition to being a top-notch comedian, Jimmy Travis is also a talented singer, songwriter and musician with five albums and four comedy videos to his credit. Travis natural gift of turning a quick phrase into a comedic song has been his unique calling card and is a hit with every audience. He has most recently written an album of childrens gospel songs that will be released in the near future. Jimmy Travis is a repeat performer in the main showrooms of Las Vegas, Reno and Lake Tahoe. 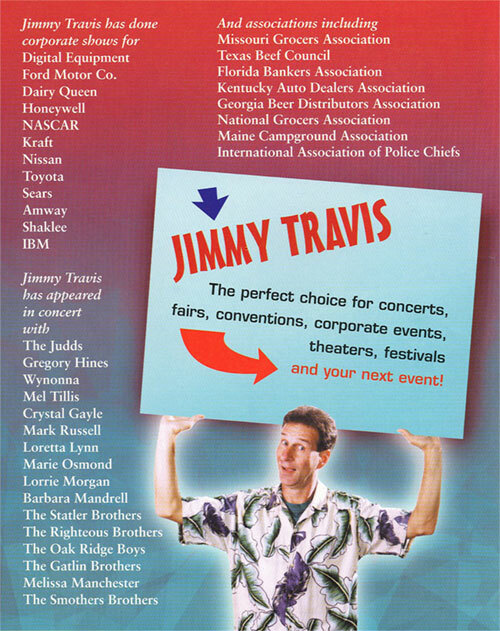 In 1997, Travis headlined 120 shows at the Charley Pride Theatre in Branson, Mo. Jimmy is also a popular convention act sporting a long list of corporations, organizations and associations who have used his talents to make their events a success. Jimmy Travis has written and recorded several jingles for his clients and for the past three years has been a spokesman for a major boat manufacturer. Jimmy Travis and his wife Gail have been married for several years and are the parents of two daughters. Great Comedy, Great Music, Great Show!